I love a good sandwich. 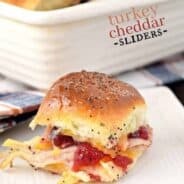 I’m talking a hearty, flavorful, MEATY sandwich. Oh, and did I mention I like it easy too? 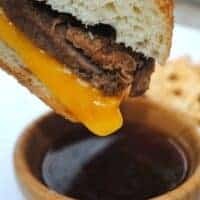 This french dip is a huge hit in our house. I wanted to bake my own french bread, but the day got away from me and I just bought some baguettes from Panera Bread. Yeah, that was the easy route. This makes A LOT of beef, so be ready to serve a crowd. Or, once it’s all cooked, strain the au jus and put beef and juice in a freezer Ziploc for later use. Enjoy! Place roast in large crockpot. Season with salt, grill seasoning, onion powder, garlic powder, pepper, beef bouillon and minced onion. Add broth and beer to crockpot, cover and cook on low for 8 hours. Take out the meat, slice or shred it (it will be falling apart). Strain the au jus so there are no clumps of meat or fat (I just use a mesh strainer). 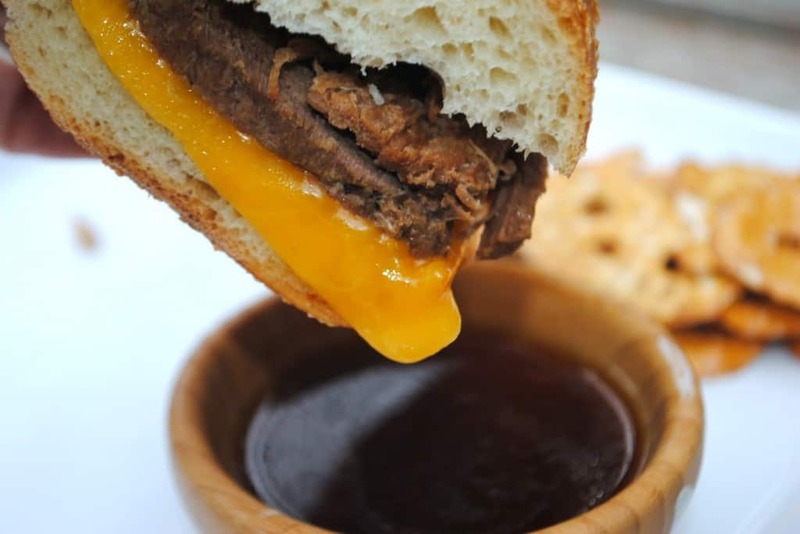 Serve french dip on french bread with cheddar cheese and side of au jus. Enjoy! Looks delicious! 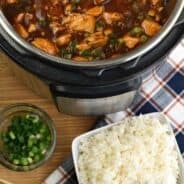 Crockpot meals are always a winner! 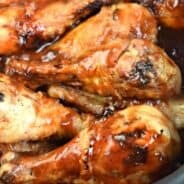 I just got a new crock pot and I am dying to get my hands on family friendly recipes to try. This looks great. Ooo, that hunk of cheese paired with that delicious beef looks delish! just thought i’d let you know that i featured you on my blog today! this recipe i mean, have a great weekend! Looks so yummy! This will be a great meal to make on a work day —- SOON! I’m trying this recipe tonight, but a half portion. I’m wondering; would you recommend keeping the same cook time (low, 8 hours)? I’m going to check it at six hours since I really don’t know. Thought maybe a comment about it might help someone else looking for a smaller batch in the future. 🙂 Can’t wait for dinner tonight! After 6 hours is should be tender if you are using a smaller roast. I tend to go the 8 hours out of convenience (put it in the morning, turn it off at dinner time). It won’t hurt the meat to go longer, it’s quite tender and juicy! Fabulous! Thanks for the quick reply. I’ll let you know what I go with – and how it turns out! I just put all of these ingredients into the crockpot and I can’t wait until 6 pm to taste it! I will let you know how it turns out! Thanks for the recipe! I have the same question about the beer. We don’t drink beer, so I’m looking for a substitute. Should I just increase the beef broth? aimee @ shugarysweets, I also am waiting for your response regarding the beer. We’re not drinkers so would just adding more broth work? Pingback: January Slow Cooker Menu - My Life, Blogged. Which dark beer do you recommend for the best flavor? I’m just curious if anyone made it without the beer? Our beer is past its prime so I’m going to try without it. Cross your fingers! I’ve used beef broth when I had no beer in the house, hope that helps!